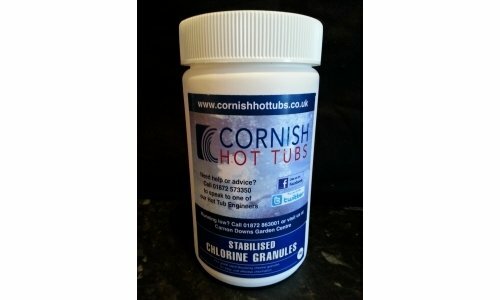 Cornish Hot Tubs Stabilised Chlorine Granules are ideal for daily dosing of your spa, to produce free active chlorine which kills bacteria and other potentially harmful organisms. They are rapid dissolving and have minimal impact on pH. 1. Usespa test stripsandph balanceproducts to maintain pH level within the ideal range of 7.2 - 7.6. If the level is not in this range, adjust! 2. Maintain free chlorine residuals within the range 3 - 5 mg/l (ppm). (Freshly filled spas require initial shock or start up dose of 50mg/l (ppm) for 1 hour or 20mg/l (ppm) for 2 hours. 3. These chlorine granules may be applied directly to spas where temperatures exceed 20 degrees C.
If below this temperature or if in doubt pre-dissolve the chlorine granules in a clean plastic container at a maximum rate of 10g of product per 0.2 gallons (1lt) of water. Stir well to ensure the chlorine is fully dissolved. Carefully add the resulting solution to the spa whilst the pump(s) are turned on, preferably near the water inlets and jets to aid distribution. 4. Repeat dose application if necessary to achieve levels in point 2 above. 5. Use the Insta test 4in1 test strips to check the chlorine level is within the range 3 - 5mg/l (ppm) before bathing recommences. Never mix with any other chemical including cleaning products and other chlorine products, as a dangerous reaction may occur. When pre-dissolving chlorine granules, always add to water not vice versa. Ensure chemicals do not become damp in storage - store spa chlorine granules in a cool dry place, and out of reach of children!